This dinosaur egg nest is from the Segnosaur dinosaur, Therizinosaurus, an unusual type of dinosaur. Most Segnosaurs laid their eggs in nests of a half-dozen or more eggs. Usually, hatching and scavenging damaged the nests, obliterating any trace of the eggs that remained. Occasionally, some eggs survived predators and the elements, and eventually became fossils. Because of their delicate nature, intact eggs are very rare in the fossil record. And finding a complete or partial egg nest is even rarer. 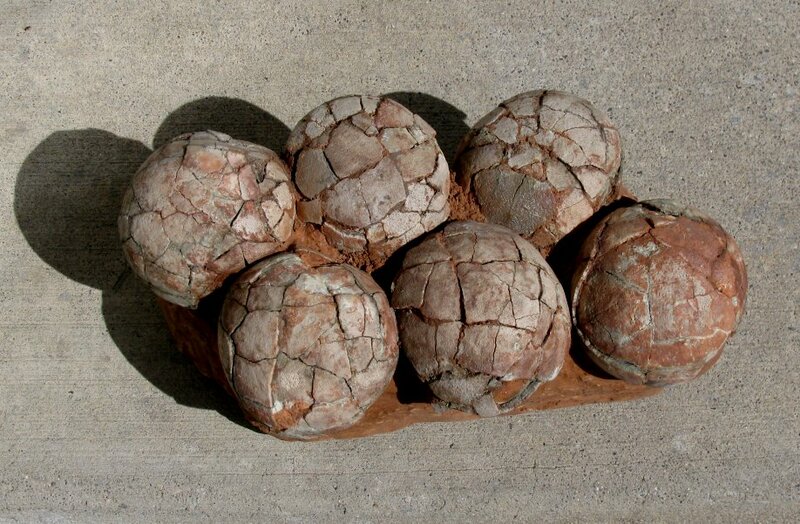 Dinosaur eggs that retain their original shape and eggshell are some of the most collectible fossils in the world. This incredible nest has SIX intact and complete eggs. All SIX eggs have the original eggshell still preserved, which is extremely rare. The eggs are extremely inflated, not crushed flat, as is usually the case. The distinct eggs display beautifully on the large block of matrix. This is a museum quality dinosaur egg nest from this unusual type of dinosaur that just happens to have a HALF A DOZEN eggs preserved!